Off to the next adventure! 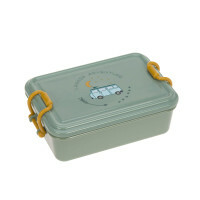 LÄSSIG’s Lunchbox from the Children's Adventure Collection, in the bus design, keeps hungry adventurers well equipped. Thanks to the flexible divider and a silicone ring in the lid food stays fresh and tasty. Product information "Lunchbox, Adventure Bus"
description & equipment Off to the next adventure! LÄSSIG’s Lunchbox from the Children's Adventure Collection keeps hungry adventurers and explorers well equipped. The Lunchbox includes a practical, flexible removable divider for different snacks. 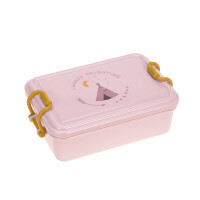 The silicone ring in the lid ensures the Lunchbox is securely closed and the food stays fresh and tasty. The Lunchbox in the trendy adventure design in dusky pink with a tipi, or in blue with a bus, can be easily cleaned in the dishwasher.